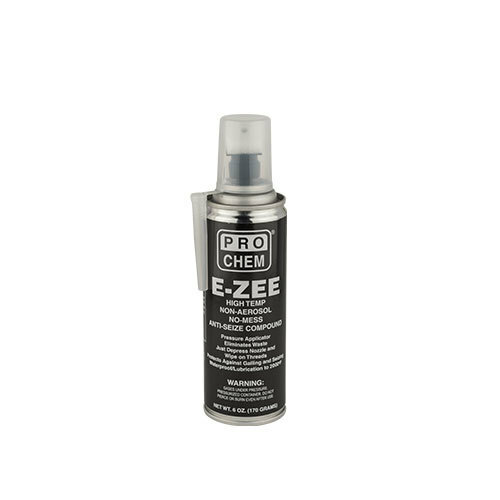 E-Zee | Pro Chem, Inc.
E-ZEE is designed as a preventative maintenance tool for protection of threaded fittings. This anti-seize contains a synthetic grease that is highly water resistant and non-melting. In addition, it has a unique base polymer which depolymerizes and dissipates at temperatures above 400°F without leaving a caked on carbon residue, which is ideal in high temperature and frequent applications It is free of copper, so it can be safely used on stainless steel and other sensitive alloys. When applied as directed, this product “plates” metal surfaces with a film of aluminum and graphite, protecting them up to 2,000°F. A unique blend of metallic solids, dry-film lubricants and anti-galling agents provides a superior product that will not melt or run out after application.. Surface should be clean before applications. Remove plastic cap from applicator. Press applicator against threads to activate pressure valve to eject compound. Move applicator around surface to apply compound evenly. Caution: This product is not recommended for use on Oxygen systems or for use with strong oxidizing chemicals. Read all information on labels and Safety Data Sheets prior to use. All products should be tested & evaluated for a particular purpose prior to use.